The WikiLeak makes leaking on a historical level a digital transfer. Until WikiLeaks, publishers have always controlled the information. Now, the leaker is the journalist. WikiLeaks founder Julian Assange says he doesn’t know the identity of any sources who leak it informationaccording his cooments at a gathering at the Frontline Club in London Tuesday night. In 2006 a loose association of anti-censorship activists, lawyers and internet experts realised that the combination of the internet and sophisticated new anonymity tools could create a whistleblowers' haven where sensitive documents could be posted without fear of reprisal.The concept was that posting leaked documents could become as easy as posting an entry in Wikipedia. Wikileaks is a grouping of like-minded activists around the globe fronted by Assange, an Australian freedom-of-information advocate and former computer hacker. He and his colleagues – many of whom are lawyers – have taken advice on anonymising technology from experts such as Ben Laurie, pioneer of SSL – the "secure sockets layer" that keeps web transactions secure. 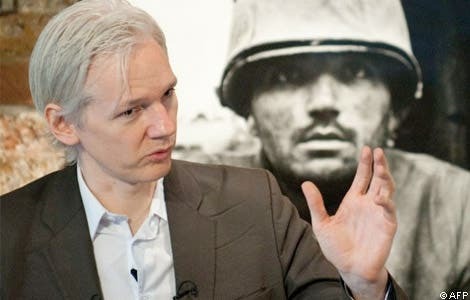 At the start of a talk streamed live on the Frontline’s website, Assange was asked by an audience member whether he knows the identity of the person who sent WikiLeaks the Afghan war documents published by three media outlets on Sunday. Rumors within the Obama adminsration points to the leaker in this case as Bradley Manning, a U.S. Army intelligence analyst charged in a separate leak. Military investigators say they are investigating his computers to see whether he’s the source of the new leak, too. With the release of 90,000 leaked US intelligence documents about the war in Afghanistan how is anyone who puts top secret documents online avoid getting caught and prosecuted? Ironically, despite its anti-authoritarian stance on censorship, Wikileak's main strength comes from technology developed by the Pentagon called The Onion Router – or Tor – that enables users to post documents without fear of being traced. The Tor network uses around 1000 volunteer servers around the world. To transmit a document, a whistleblower downloads a piece of software called a Tor client and uses it to inject the document into the Tor network. The document then bounces between Tor servers in a random manner, using layers of encryption to obfuscate its source address. Eventually it emerges at the destination – in this case Wikileaks. Wikileaks is hosted in Sweden, where robust freedom-of-information legislation makes a takedown order unlikely. A similar site in transparency-friendly Iceland is being investigated. In addition, Wikileaks is mirrored at undisclosed locations around the world, so if it's disabled in one location, other sites can take over. In addition to the 90,000 documents relating to the Afghanistan campaign are some 1.2 million documents that include claims of government corruption in Kenya, the design for the Hiroshima atom bomb and the military rule book for the Guantanamo Bay detention camp in Cuba. A recently released Wikileaks' video, Collateral Murder, showed a US army helicopter attack that killed 12 people, including two Reuters journalists, in Baghdad, Iraq, in 2007. So can you post to Wikileaks without fear of being caught?